This book examines North Korea’s nuclear diplomacy over a long time period from the early 1960s, setting its dangerous brinkmanship in the wider context of North Korea’s military and diplomatic campaigns to achieve its political goals. It argues that the last four decades of military adventurism demonstrates Pyongyang’s consistent, calculated use of military tools to advance strategic objectives vis à vis its adversaries. It shows how recent behavior of the North Korean government is entirely consistent with its behavior over this longer period: the North Korean government’s conduct (rather than being haphazard or reactive) is rational – in the Clausewitzian sense of being ready to use force as an extension of diplomacy by other means. The book goes on to demonstrate that North Korea’s “calculated adventurism” has come full circle: what we are seeing now is a modified repetition of earlier events – such as the Pueblo incident of 1968 and the nuclear and missile diplomacy of the 1990s. 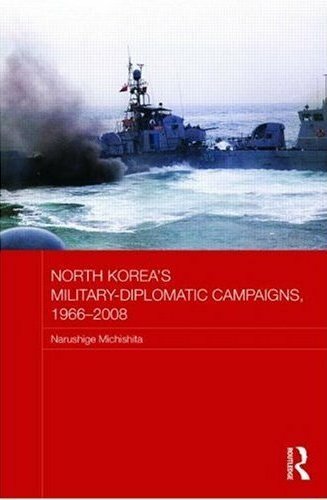 Using extensive interviews in the United States and South Korea, including those with defected North Korean government officials, alongside newly declassified firsthand material from U.S., South Korean, and former Communist-bloc archives, the book argues that whilst North Korea’s military-diplomatic campaigns have intensified, its policy objectives have become more conservative and are aimed at regime survival, normalization of relations with the United States and Japan, and obtaining economic aid. Why do we study Korea? In 2009, the Korea-Australasia Research Centre (KAREC) at the University of New South Wales (UNSW) have commenced a national project funded by the Commonwealth Department of Education, Employment and Workplace Relations. Through the Strategic Collaboration and Partnership Fund a total of $9.36 AUD million over three competitive funding rounds will be available to organisations, including universities, higher education providers, businesses and Asian communities. The KAREC’s National Asian Languages and Studies in Schools Program (NALSSP) focuses on Korean language and studies education in Australian schools. It is also in line with the government’s aim to increase opportunities for school students to become familiar with the languages and cultures of Australia’s key regional neighbours: China, Indonesia, Japan and Korea. 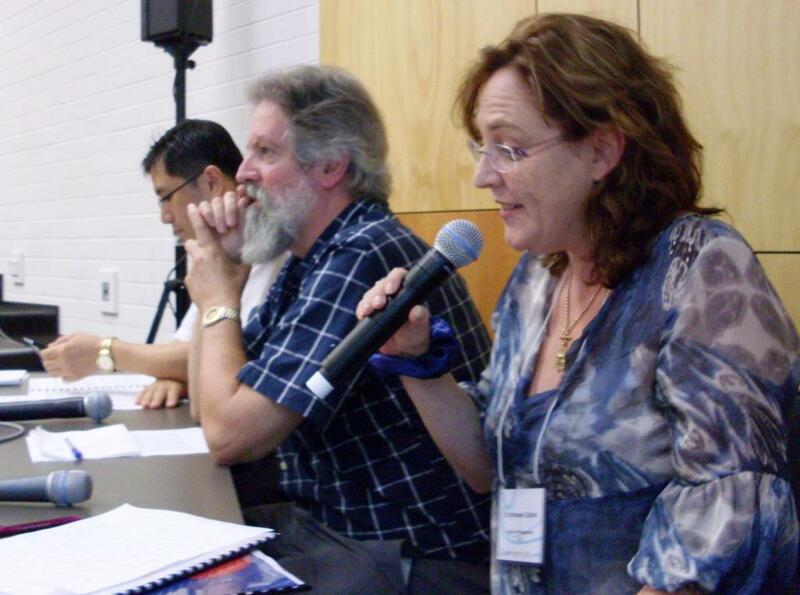 As the first milestone of the Project, KAREC has organised a National Strategic Conference, which was held on 19–21 November 2009 at UNSW, Sydney. The purpose of the Conference was to examine the current status of Korean language and studies education in Australia and to establish a long-term strategy to ensure continued development. The major theme of the Symposium on the 19th of November was the current situation, issues and challenges of, and strategies for Australia’s Korean language and studies education. On the 20th of November, there was a round-table discussion on the coverage of Korea in high school non-language subjects. Korean Studies academics and high school teachers of Society and Environment, English and Arts participated in this discussion. On the 21st of November, a workshop for Korean language teachers in Australia was held. What motivates us, while residing in Australia, America or Europe, to invest our time, money and effort to examine the past of this small country, squeezed between the giants of East Asia? It must be our interest in Korea’s dynamic present and promising future that stimulates our curiosity about its tumultuous history. A training approach that advocates the practical application of Korean studies in economy and trade, politics and international relations, administration and communication can achieve a double benefit. 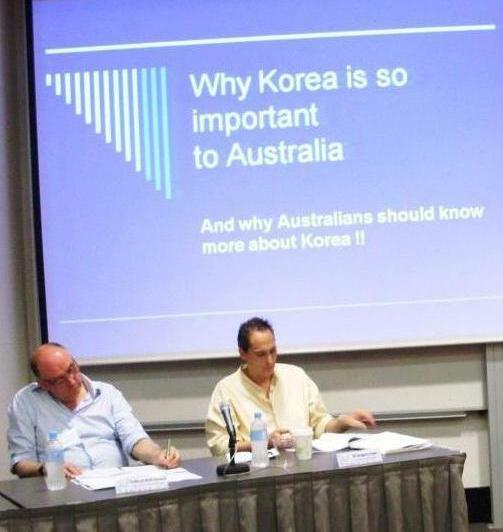 The socio-economic and political position of Korea, in such circumstances, is pivotal for success or failure of Korean studies in Australia and elsewhere. When choosing a regional language, students must realize that Korea provides them with many more opportunities than, say China or Japan. 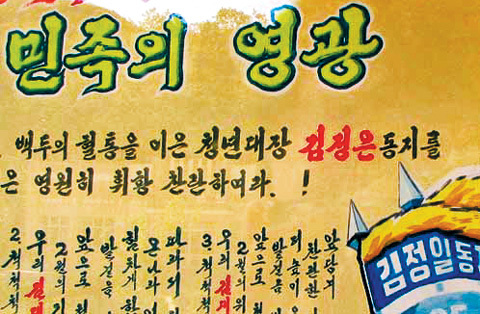 Engaging the DPRK: A “Deferred Delivery” Option? by Georgy Toloraya, “Engaging the DPRK: A ‘Deferred Delivery’ Option?” The Asia-Pacific Journal, 47-3-09, November 23, 2009. Regardless of rhetoric, there is little doubt that North Korea is not prepared to give up its nuclear capability any time soon. Although it might simply be a bargaining position, Pyongyang has even made it clear that there can be no such outcome until the whole world becomes free of nuclear weapons. That creates a new strategic reality – even if we do not recognize North Korea as a nuclear power, we will have to live side by side with it as a de-facto nuclear possessing state for a considerable period of time. While the United States is separated from it by an ocean, for Russia, China and South Korea there is just a river or a border. How are all the parties concerned going to deal with this country? Although the risk of conflict has probably not increased with the DPRK becoming a de-facto nuclear power, a further escalation of tensions is a serious threat. Nuclear proliferation and the emergence of new regional nuclear powers also constitute serious threats. To avert such threats, the diplomatic process, even when seemingly fruitless, must be maintained. Additional pressure on North Korea would only be likely to result in further provocative actions by Pyongyang, including new WMD programs, increased risk of proliferation, and even military actions near the southern border (although probably limited) meant to discourage its opponents from stepping up the pressure. Such spiraling tensions, with the potential of leading to open conflict, should be avoided by re-engagement of the de-facto nuclear North Korea. The choice is between a hostile and cornered nuclear North Korea and a nuclear North Korea engaged in a search for compromise and acting responsibly. The current cycle of tensions leading to the emergence of the DPRK as a de-facto nuclear weapons state started when North Korea became disappointed concerning the lame-duck Bush administration’s true intentions in the Six Party talks. North Koreans grew frustrated as their actual gains from the diplomatic process were marginal – they did not come much closer to obtaining substantial security guarantees. Even a largely symbolic (and easily reversible) “delisting” of DPRK as a terrorist state caused much controversy in the US and abroad, and when the US demanded new concessions in exchange from North Korea, they saw this as a breach of trust. As to the modest economic assistance promised when the accord was sealed, only the US and Russia actually fulfilled their obligations (200,000 tons of heavy oil), while other countries either totally abstained (Japan) or dragged their feet (ROK). For its part, the DPRK felt that its concessions were not fully recognized and valued. Georgy Toloraya is Director of Korean Programs, Institute of Economy, Russian Academy of Science. Recommended citation: Georgy Toloraya, “Engaging the DPRK: A ‘Deferred Delivery’ Option?” The Asia-Pacific Journal, 47-3-09, November 23, 2009. (Daily NK) On the 10th November 2009, the North Korean patrol vessel crossed the NLL at 11:27AM at a point 11.3 kilometers off the east coast of Daecheong Island, which lies in South Korean territorial waters just 2.2 kilometers from North Korea on the west side of the peninsula. The North Korean vessel apparently did not change direction, so at 11:36 the South Korean naval vessel fired warning shots across its bow. At 11:37, the North fired approximately 50 shots at the South Korean vessel, and the South simultaneously returned fire with around 100 shots from a 40mm cannon. The battle lasted for approximately two minutes, until the North Korean patrol vessel went back across the NLL at 11:40 after suffering “considerable” damage. Yonhap News reports that this skirmish is the first for seven years. In previous clashes, 30 North Koreans were killed in 1999, while 19 navy personnel from both sides were killed in a 2002 battle which lasted for more than half an hour. North Korea officially disputes the location of the NLL, which was drawn on a unilateral basis by the UN forces at the culmination of the Korean War. North Korea officially adheres to a more southerly line, a line which would, if enforced, put Daecheong Island and neighboring Baekryeong Island north of its maritime jurisdiction. South Korean Prime Minister Chung Un-chan told lawmakers during a televised parliamentary session that the North Korean boat returned across the border while “wrapped in flames.” He also said the incident was “accidental.” President Lee Myung-bak convened an emergency national security meeting, calling for “calm” in dealing with the situation. “The president instructed the military to react decisively, yet calmly to make sure the situation does not further deteriorate,” Lee Dong-kwan, a presidential aide, said in a release. The South Korean Navy sounded a warning twice before the North Koreans crossed the NLL — a de facto border drawn at the end of the Korean War — and three times afterward, according to Lee Ki-shik. The naval boats were a little over 3km away from each other when they exchanged fire, Lee said, stressing the South Korean Navy followed standard operating procedure before the shooting erupted. The North’s Korean People’s Army said in a statement released through official media that a “group of warships of the South Korean forces hastily took to flight” after violating the NLL. The “combat-ready” North Korean patrol boat “lost no time to deal a prompt retaliatory blow at the provokers,” the statement said, carried by the Korean Central News Agency (KCNA) and monitored in Seoul. South Korean Defense Minister Kim Tae-young said in a parliamentary session that “no additional moves” by the North Korean military were detected north of the heavily armed border. South Korean analysts gave mixed views about North Korea’s possible motive behind the incident, which took place only a week ahead of an Asian trip by U.S. President Barack Obama. The clash came amid an accelerating thaw between the Koreas, whose relations turned frosty following the inauguration of South Korean President Lee Myung-bak early last year. It also came as French President Nicolas Sarkozy’s special North Korea envoy was in the communist state for talks with its foreign minister on “matters of mutual concern,” according to KCNA. Slapped with sanctions for its May nuclear test, North Korea has in recent months extended peace overtures to the outside world, while South Korean media speculated the two Koreas were working secretly to set up summit talks. Kang Sung-yoon, a North Korea specialist at Seoul’s Dongguk University, said the North Korean attack on the South appears to serve more than one purpose. “It could be aimed at pressuring both the U.S. and South Korea to engage in dialogue with Pyongyang more seriously,” he said while warning against reaching a quick conclusion on the issue. “Details regarding the incident should be looked at to understand what the North Korean intent really was,” he said. De nordkoreanske flygtninge har forladt den danske ambassade i Vietnam, og er på vej mod asyl i Sydkorea. Men det har ikke været nemt at finde en løsning, vurderer ekspert. BEIJING: De ni nordkoreanere, der i næsten en måned har boet på den danske ambassade i Hanoi, forlod tirsdag morgen den vietnamesiske hovedstad og er nu på vej mod Sydkorea. Det siger en anonym vietnamesisk diplomat til nyhedsbureauet AFP. Udenrigsministeriet har bekræftet oplysningen til Ritzau. Gruppen bestod blandt andet af en 19-årig kvinde, hvis mor tidligere var flygtet med hendes søn til Sydkorea, en 42-årig læge og hans hustru samt en mor og hendes 13-årige datter. Det har den sydkoreanske aktivist Kim Sang-Hun fra International Network of North Korean Human Rights Activists tidligere oplyst. Sammen med to andre NGO’er hjalp de gruppen med at komme frem til den danske ambassade, som de gik ind på den 24. september. Her har de boet i et blåt telt på ambassadens grund, mens der blev forhandlet om en diplomatisk løsning for de uindbudte gæster. Den blev fundet tirsdag morgen. Her steg de ni personer ombord på et fly, der efter en mellemlanding i Singapore bringer dem videre til Sydkoreas hovedstad Seoul. Og det er ikke tilfældigt, at det skete netop i dag. Kort efter flyet med nordkoreanerne var lettet fra lufthavnen, landede der et andet fly med den Sydkoreanske præsident Lee Myung-bak, der nu er på sit første officielle besøg i Vietnam. Hvis der ikke var blevet fundet en løsning for de ni flygtninge, kunne det have udviklet sig til et diplomatisk problem mellem Vietnam og Sydkorea. Ligesom Nordkorea er Vietnam et kommunistisk land, og de to lande har tætte forbindelser. Regeringen i Hanoi vil derfor ikke fornærme Nordkorea. Men Vietnam er et langt mere åbent land, der får stadig tættere økonomiske og politiske forbindelser med omverdenen og demokratiske lande som Sydkorea. »Der har helt sikkert ligget et stort diplomatisk arbejde bag det her, og det har ikke været nemt at finde en løsning,« siger Leonid Petrov, der er lektor i nordkoranske forhold på University of Sydney. »Ved at lade flygtningene rejse ud af landet, sender Vietnam et signal til Sydkorea om, at de er ansvarlige. Samtidig sender de også en besked til Nordkorea om, at de lægger langt mere vægt på menneskerettigheder end politiske signaler,« siger Leonid Petrov. …Few international conflicts are as volatile, protracted, or seemingly insoluble as the one in Korea, where mutual mistrust, hostile Cold War attitudes, and the possibility of a North Korean economic collapse threaten the security of the entire region. For Roland Bleiker, this persistently recurring pattern suggests profound structural problems within and between the two Koreas that have not been acknowledged until now. Expanding the discussion beyond geopolitics and ideology, Bleiker places peninsular tensions in the context of an ongoing struggle over competing forms of Korean identity. Divided Korea examines both domestic and international attitudes toward Korean identity, the legacy of war, and the possibilities for-and anxieties about-unification. Divided Korea challenges the prevailing logic of confrontation and deterrence, embarking on a fundamental reassessment of both the roots of the conflict and the means to achieve a more stable political environment and, ultimately, peace. In order to realize a lasting solution, Bleiker concludes, the two Koreas and the international community must first show a willingness to accept difference and contemplate forgiveness as part of a broader reconciliation process. Roland Bleiker is professor of international relations at the University of Queensland. From 1986 to 1988 he served as chief of office for the Swiss delegation to the Neutral Nations Supervisory Commission in Panmunjom. Although many North Koreans know about the pending father-to-son power transfer in their country’s ruling family, talking about the dynastic power succession in public is forbidden in the socialist country. Nevertheless, signs of the power transfer from the current leader, Kim Jong-il, to his youngest son, Jong-un, are evident in the reclusive state these days. North Korea appears to have established a propaganda song praising the heir apparent as a regular theme during public events, with the latest performance aired on state television. Analysts say the move proves Kim Jong-il’s faith in his third son as the next leader of the state. According to intelligence sources, the North’s state-run Korean Central TV Broadcasting Station reported on Oct. 9 that Kim Jong-il attended a show at North Hwanghae Provincial Art Theater, south of Pyongyang, and a choir performed the song called “Footsteps” as part of commemoration of the newly built art center. It was the fifth time for the leader to attend an official event where the song was played, according to intelligence officials. In the Oct. 9 television broadcast, belatedly discovered in South Korea, still photos from the concert show the title of the song displayed in green on an electronic board above the stage, while dozens of men and women sing in ensemble. “Footsteps,” reportedly written by top composer Ri Jong-o, has been widely interpreted by North Korea watchers here as extolling the valiance of Jong-un. Its title began to appear in North Korean media in February, when the official Korean Central News Agency (KCNA) reported that soldiers in an army unit sang the song during Kim Jong-il’s inspection visit there. The song surfaced again during an April 26 ceremony marking the founding of the North’s Korean People’s Army. Seoul’s Unification Ministry would not say whether it was a sign that a power transfer is underway. “We have intelligence indicating the song is for Kim Jong-un, but it’s a matter of interpretation if this means a succession process being consolidated,” ministry spokeswoman Lee Jong-joo said. The ministry also confirmed Oct. 26 that a caption flashed the word “Footsteps” as it was being performed. The song’s lyrics begin: “Tramp tramp tramp / the footsteps of our General Kim / spreading the spirit of February / tramp tramp tramping onwards.” General Kim is believed to be a reference to Kim Jong-un, and February the month of the elder Kim’s birth. The television presented footage of Kim and his entourage clapping their hands, but it was not clear from the visual material whether they did so to the heir’s song. Kim Jong-il’s entourage during the theater visit included his sister, Kim Kyong-hui, and her husband, Jang Song-thaek, both of whom are believed to be deeply involved in grooming the heir apparent in Workers’ Party directorial posts. Other top party officials, such as Kim Ki-nam and Pak Nam-gi, were among the audience, along with residents of the province. North Korea watchers likened the move to former leader Kim Il-sung’s praise of his son, Kim Jong-il, in public before his succession. Kim Jong-il, now 67, reportedly suffered a stroke in August last year…. … Cheong Seong-chang, an expert with the non-governmental Sejong Institute south of Seoul, said the North is now directing the succession process in a more subtle way, in contrast to its earlier nuclear and missile tests that were believed to have been aimed at supporting the power transition.